Countries that have been widely criticised for severe human rights abuses are among 18 newly elected members of the UN Human Rights Council. Campaigners had urged UN member states to oppose the candidacy of the Philippines and Eritrea and said the choice of Bahrain and Cameroon raised "significant concerns". The US quit the council in June, saying it made a mockery of human rights. But its defenders say it does vital protection work around the world. Countries can serve for two consecutive three-year terms on the council, which is based in Geneva. Are we facing a 'post human rights world'? Why did US pull out? 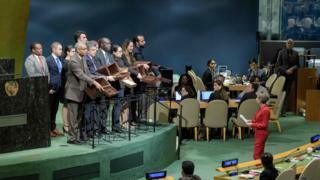 The UN General Assembly in New York approved the new members in a vote on Friday. For the first time in the council's history, the five voting regions had only put forward as many candidates as there were seats available, thus removing any competition. Human Rights Watch's (HRW) UN director Louis Charbonneau called the election "a mockery" in a Twitter post. The organisation said Philippines President Rodrigo Duterte's crackdown on drugs had been "a killing frenzy that has left thousands dead" and that Eritrean authorities had persecuted and jail government critics. The Philippines government has previously dismissed claims of human rights abuses, saying President Duterte had employed "lawful use of force" against threats to the country. Eritrea has also strongly denied such allegations, and insists that it treats its citizens well. HRW also criticised the candidacy of Bahrain, citing its jailing of prominent human rights defenders such as Nabeel Rajab. Mr Rajab has served several years in prison since playing a leading role in a pro-democracy uprising in 2011. Bahrain insists its criminal trials have been independent and transparent. In Cameroon, HRW said government forces and armed separatists had committed "grave abuses" in the country's Anglophone region. The government denies the allegations. In June, a spokesman dismissed similar accusations in an Amnesty International report as "filthy lies" intended to destabilise the country. Following Friday's election, US ambassador to the UN Nikki Haley said "yet again" countries with poor human rights records had run uncontested. "This lack of standards continues to undermine the organisation and demonstrates again why the United States was right to withdraw from it earlier this year," she said. In June, Ms Haley described the council as a "cesspool of political bias" that displayed unending hostility towards Israel - a close US ally. The UN set up the council in 2006 to replace the UN Commission on Human Rights, which faced widespread criticism for letting countries with poor human rights records become members. The UNHRC meets three times a year, and reviews the human rights records of all UN members in a special process the council says gives countries the chance to say what they have done to improve human rights, known as the Universal Periodic Review. The council also sends out independent experts and has set up commissions of inquiry to report on human rights violations in countries including Syria, North Korea, Burundi, Myanmar and South Sudan. Why did the US leave the UN Human Rights Council? Are we heading towards a 'post human rights world'?